Let go of the frames of reality. Let go of what keeps you sane. May your untapped potential wander the horizons of the Far Realm. Not every story needs heroes and not all heroes are good. 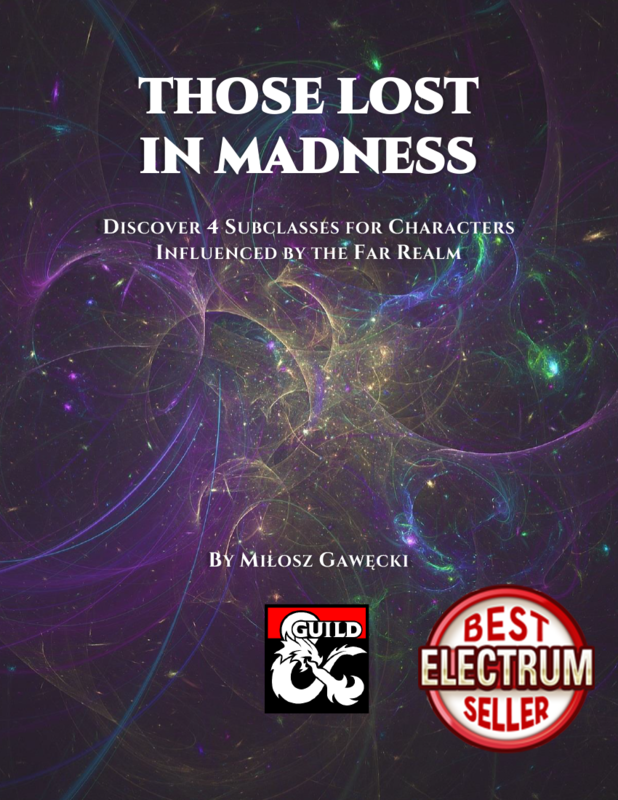 Those Lost In Madness is a supplement expanding Villainous Class Options*. It features 4 new subclasses for characters influenced by the twisted powers of the Far Realm. Change your body with hideous deformations to overpower your enemies and adapt to dangers. Others will fear you as you become a monster yourself. Your gods didn’t abandon you. You abandoned them to accept powers far more gruesome than anything you’ve known. Leave your sanity behind as your reach the stars and whatever lies behind them. Check out this subclass in the preview! There’s nothing natural about you anymore. You change the world around you to match the unimaginable horrors than fuel you. Spread an alien matter that brings the Far Realm closer than ever. Twisted energies surging through you affect your body and mind. Use them to single out and annihilate your opponents before the same powers spell your doom. This product also includes a printer friendly version! *Feel free to use them for any character as long as your DM agrees!